It is more and more current to find lathe machines that have a driven tool with milling capabilities (Driven-tool machines with a X, Z and a C axis) or Millturn machines with specific spindles for lathe and milling (X, Y, Z and C axis) that can combine a diversity of procedures such as lathe, 2.5D milling positioned milling using the C axis, side or frontal milling and continuous C axis milling. This machines are essential for the production shopfloor where the critical point is to save time in the machine of every part (even one second can be critical if the series to produce is huge). Manually programming these kind of machines is not easy and therefore the use of a CAM system is nearly essential. Fikus for Millturn and Driven-tool application offers a flexible and functional solution for today's toolmaker, and it is not dependent on the age or type of the lathe in use. Fikus for lathe and millturn is specifically designed to be quick and easy to use, using a range of innovative tools. The product is a Windows 32-bit native application, with dynamic OpenGL rendered graphics, and user interface with clear and concise icons and toolboxes, making the learning process easy. The major machine manufacturers are implemented with optimized technological tables. Fikus enables the creation and modification of required geometry, as well as importing geometry from other CAD systems via IGES, DXF or PLT. The Fikus ToolPath Manager allows for easy creation of lathe and milling procedures. This procedure is a combination of geometric and technological data presented in a logical tree, easy to create and edit at any stage in the process. The set of procedures may be saved as a template and applied to other geometries at a later stage. Using this feature, a machining process may be saved and reused. Manipulation of geometries and procedures in the ToolPath Manager (i.e., create, edit, move, copy or delete) are possible using standard Windows features - copy, cut, paste, drag and drop. The Lathe Wizard automatically recognizes all the different zones of the part and applies the right procedures. The Drilling Wizard automatically selects the drills and classifies them according to their size and type. The CAM Bar guides the user through the logical process of machining of a part. All the lathe procedures(Turning, facing, profiling, finishing, slotting, threading, cut-off). All the 2.5D Milling procedures (Drilling, Pocketing, finishing)Frontal or side machining. During the creation of the part, the user can visualize it as a solid rendered object and dynamically pan, zoom or rotate it using the OpenGL standard graphics operations. Changes made (height, draft angle, or synchronizing the contours), are automatically shown on the screen. View manipulation can be performed during toolpath simulation. 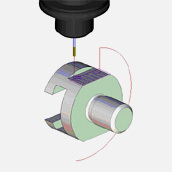 Fikus is an application that provides a solution for programming the Millturn or Driven-tool machines, assisting the user in producing complex toolpaths quickly and efficiently. Customized tables for each machine, help to obtain accurate G-codes and allow the user to work in a familiar environment. Fikus automatically detects the geometry for lathe and drilling and generates the procedures. The user can save his customized sets of procedures as templates to use them at a later time with a similar part. Fikus is a robust, flexible and easy-to-use application designed to reduce overall programming time and ultimately, improve the machining capabilities of the complex Millturn machines.